I found myself daydreaming about that peach ice cream from my last post, so I went ahead and scooped out some vanilla ice cream from the freezer and added some homemade apricot jam to it. Pretty darn good. Mmmmm. And then I got crazy and added fresh kiwi slices. Even better. 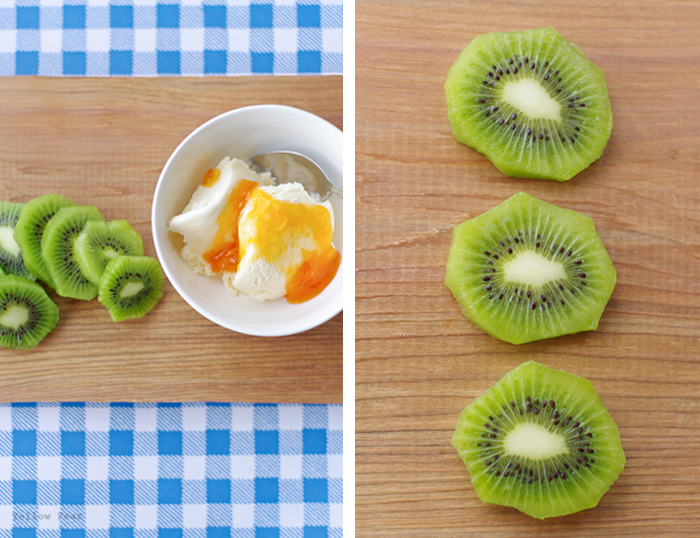 Apricot kiwi ice cream. Yum. My new favorite flavor. I triple-dog-dare you to try it. You keep your ice cream in the fridge? Interesting. Goodness no! I keep my ice cream in the freezer like everyone else. Silly me. I fixed it!! Love it! So colorful and fresh!